Sneak Peek From Down Unda: Silver Bullet Tanks are Coming Back! 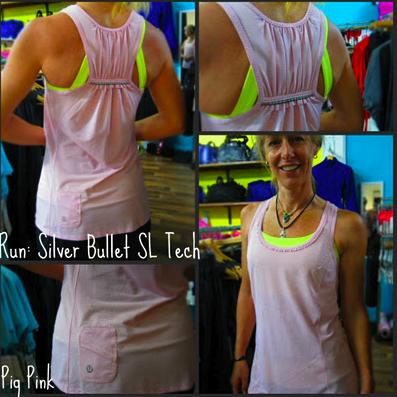 Australian stores got these new Run: Silver Bullet Tanks in Pigment Blue, Pig Pink and Black. I’m a bit surprised since this color pallet is current for Winter but the last run of silver bullets were out in August. I don’t expect we would see warm weather running tanks until early spring which should be past this color pallet but maybe these colors will see a return at a later date, or we will see these very soon. Ah well! 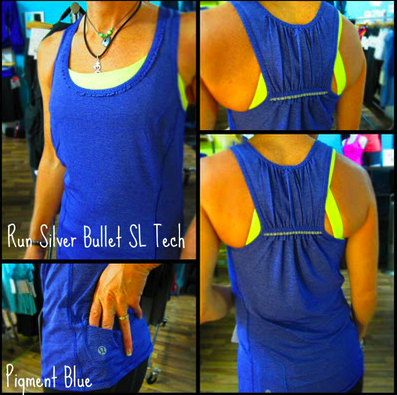 I love the silver bullet tank and have one in Magnum with a reflective feather print at the neckline. I’d definitely be interested in the Pigment Blue or Pig Pink. "Lay Low Camo Speed Shorts in Aquamarine and Paris Pink"
"New Cool Racerback Tank! Discover Stripe White Deep Indigo"